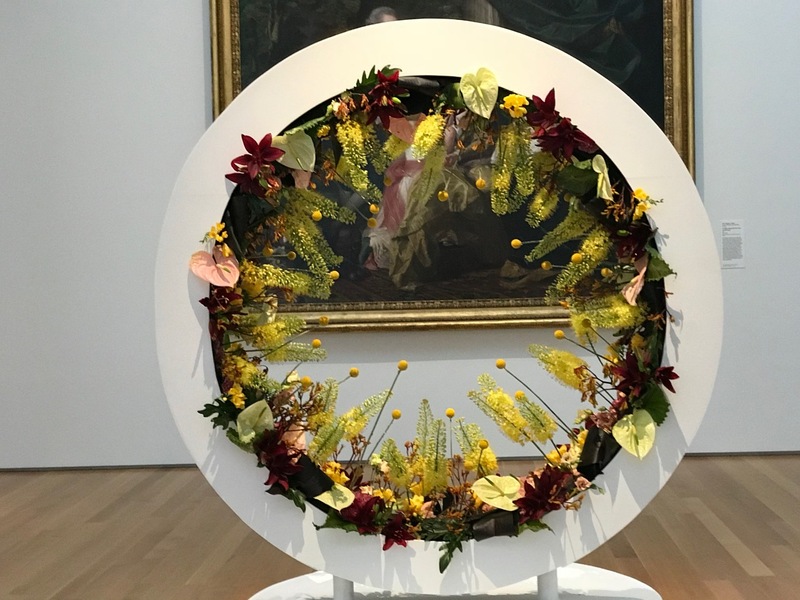 I wanted to share a few more entries from last week’s Art In Bloom at the North Carolina Museum Of Art. Whether you agree or not, I think you will be able to appreciate why this is my favorite from this year’s show. One of the most exquisite designs in the show, the color palette is masterful. 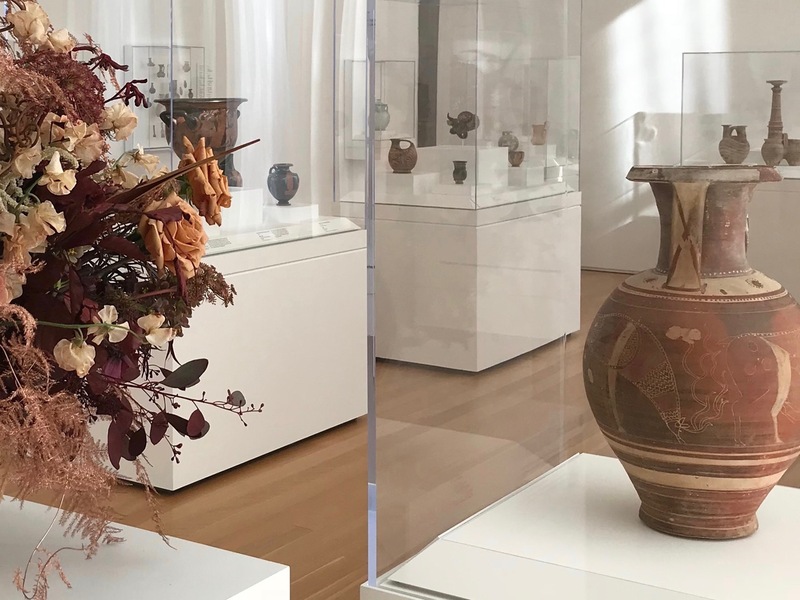 It is designed by Stacey Burkert, inspired by Etrusco-Corinthian, Neck-Amphora. 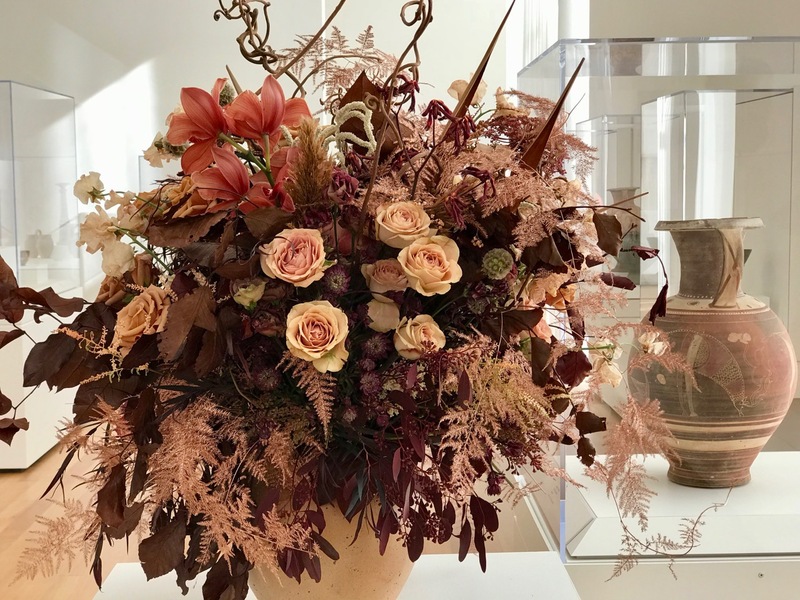 The designer’s statement reads: This terracotta urn has worn to reveal an incredible array of earth-toned color variations. My aim is to capture these hues along with the eroded, natural texture of the amphora. For me the initial impact was all about color. 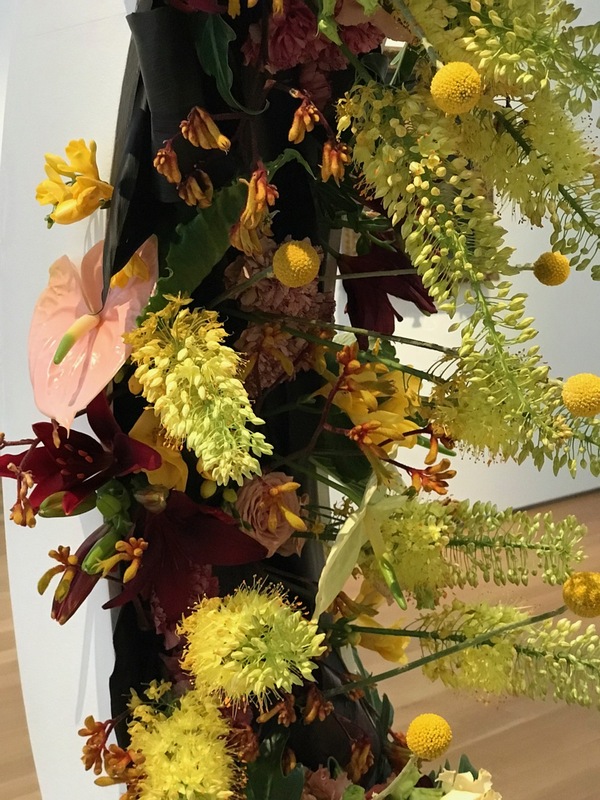 As I studied it the textural elements of all materials in the arrangement seemed perfectly chosen. 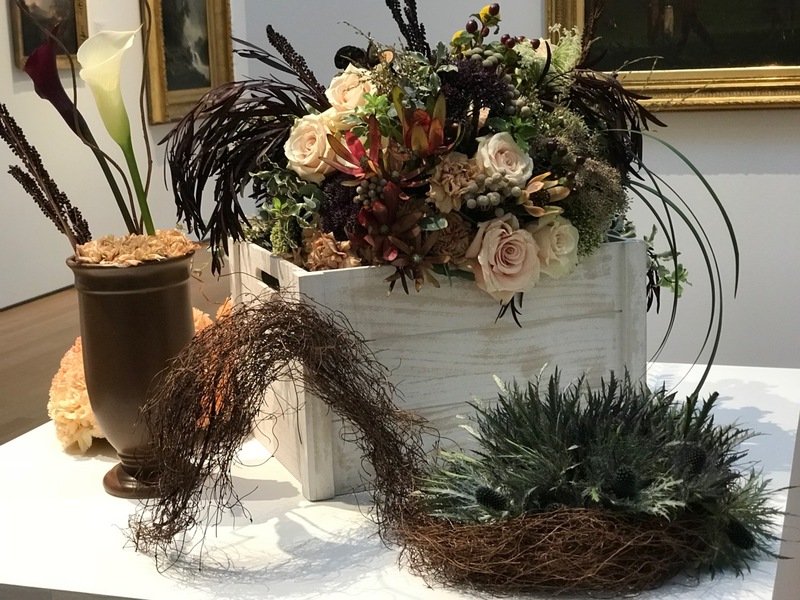 The primary floral materials listed in the catalog were: roses, amaranthus, orchids, fritilaria, thistle, seeded eucalyptus, cosmos, scabiosa pod, astilbe, hellebore. The previous pictures all view the flowers from the back side because from the front, outside light coming into the gallery placed the design in silhouette. The color is off in this next one but I wanted to show you this front side anyway—the shape is a bit different. Here are a few more designs from the show. This one captures the lines and rich colors of George Bireline’s Red Shift. 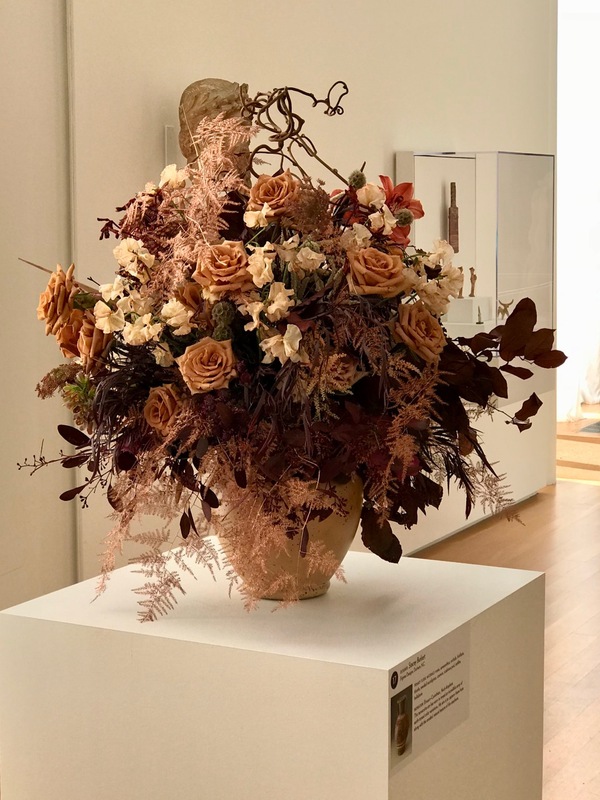 Bireline was in the first class of the graduate studio art program at the University of North Carolina at Chapel Hill and a long-time professor at N.C. State University’s School of Design. There was harsh overhead light that made photographing this design a challenge. 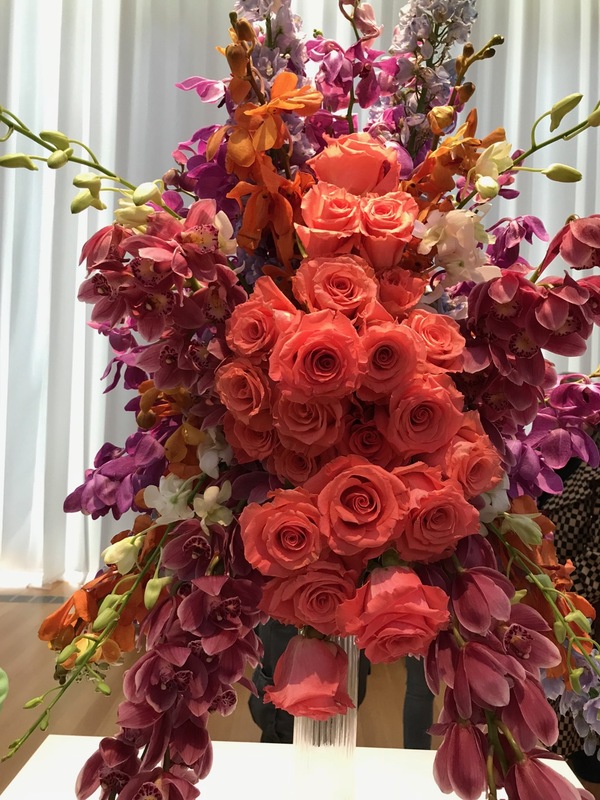 Beautiful masses of roses, various orchids and delphinium were used. This design is based on the painting in the background by Childe Hassam. 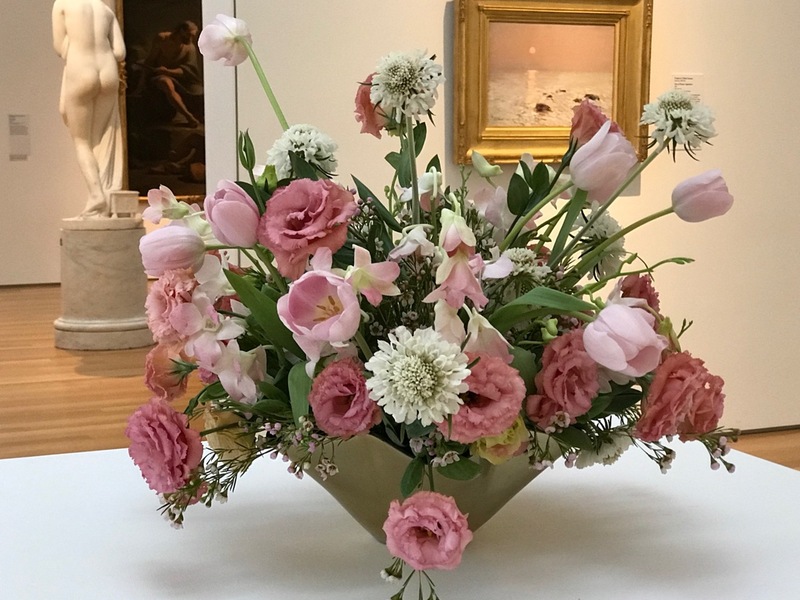 The flowers reflect the soft pastels; the vase, the golden frame. I have long admired the Thomas Hart Benton painting on the left that inspires this next designer. Designer: Amber Cassle. 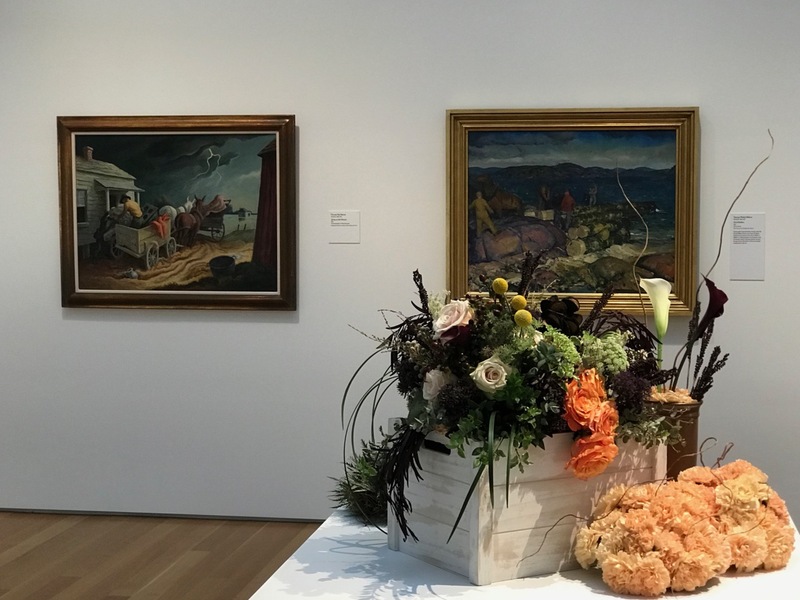 Inspiration: Spring on the Missouri, Thomas Hart Benton. Spring on the Missouri depicts a family packing up a horse-drawn cart under threatening skies to escape the flooding river. Oddly, I misremembered this painting and thought of it as a Dust Bowl-era family. yet, the work is beautiful and fascinating. And what to do with this Rodin? 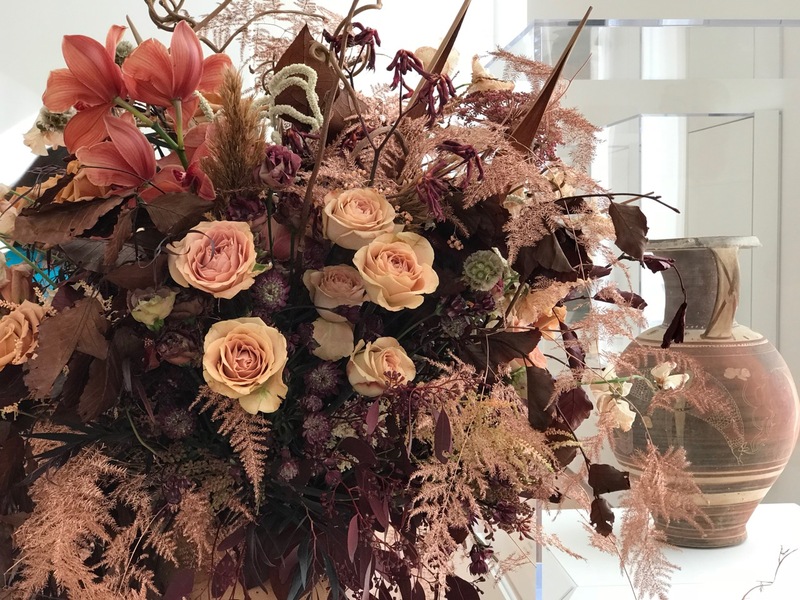 Jane Owen Barbot used ageratum, bovardia, beehive ginger, chrysanthemum, cymbidium, dianthus, echeveria, roses, tai leaves, fasciated willow in her design. I lost track of who designed this, but many patrons enjoyed having their photo taken through the opening. I believe the soft yellow spikes are Foxtail Lilies (Eremurus). Well, there were more (over fifty entries), but I must move on to other projects. 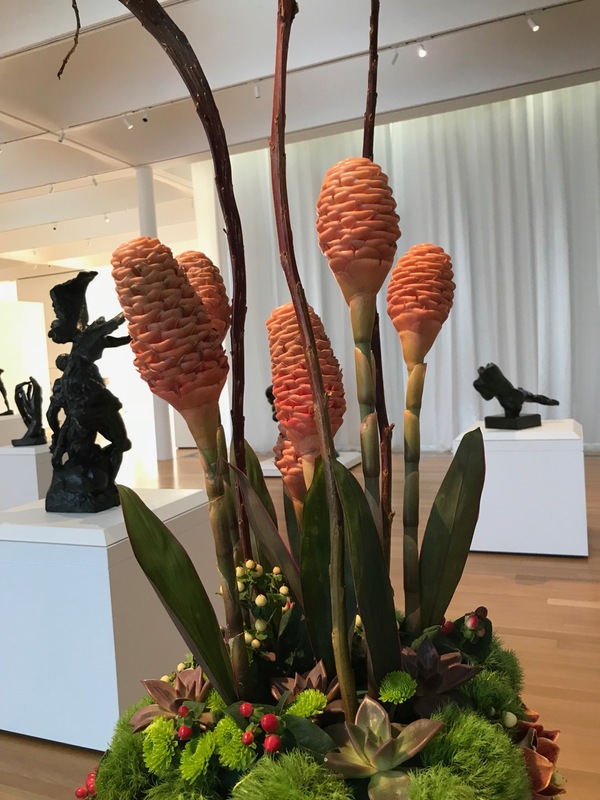 You have been kind to tour with me as I revisited some of Art In Bloom. I leave you with some final images from the show. 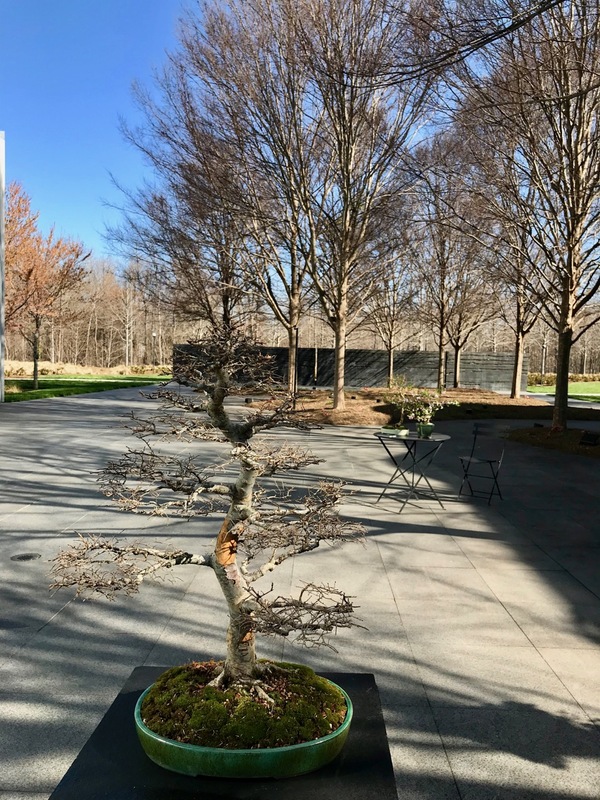 Members of Triangle Bonsai Society were on hand to talk everything bonsai. 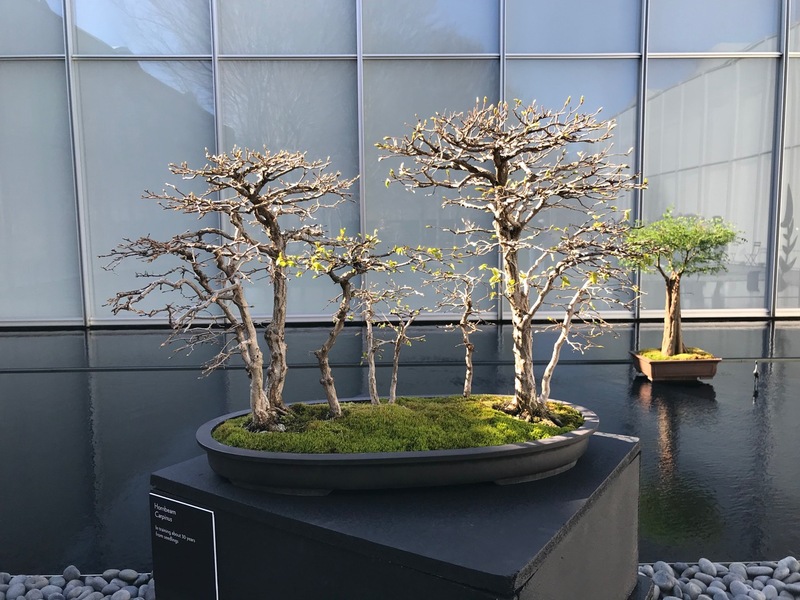 This one was particularly striking against the backdrop of the leafless trees. 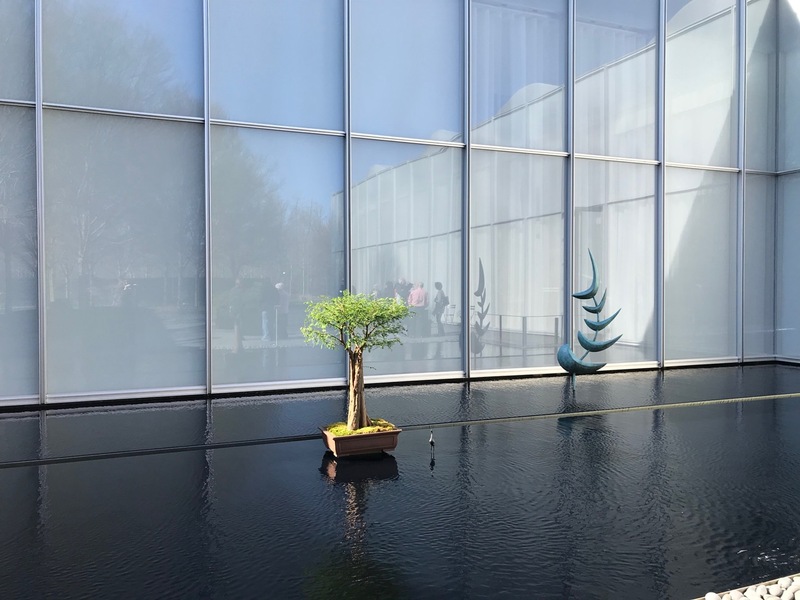 The reflecting pool made a lovely space for display. 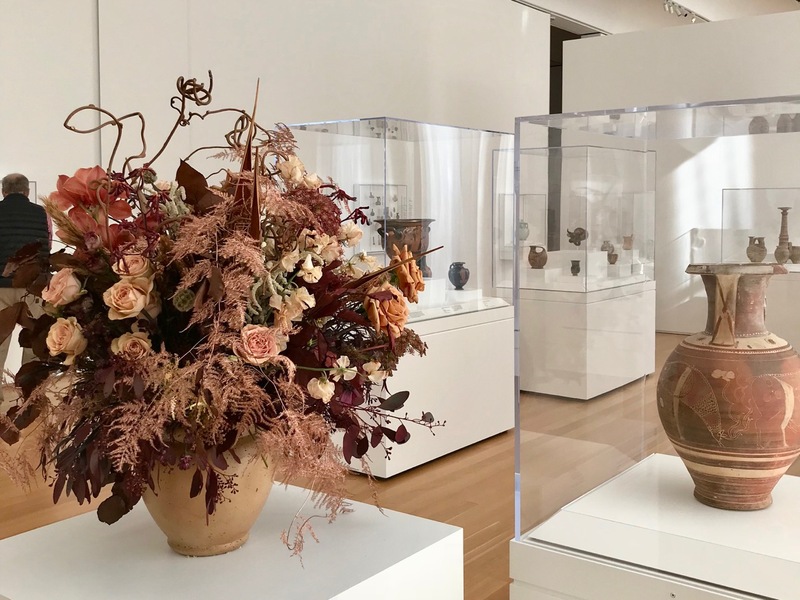 After meeting friends for lunch at one of the Museum cafés, I attended “Influenced By The East—Elements of Sogetsu Ikebana Presentation,” featuring Denver floral artist Arthur Williams. 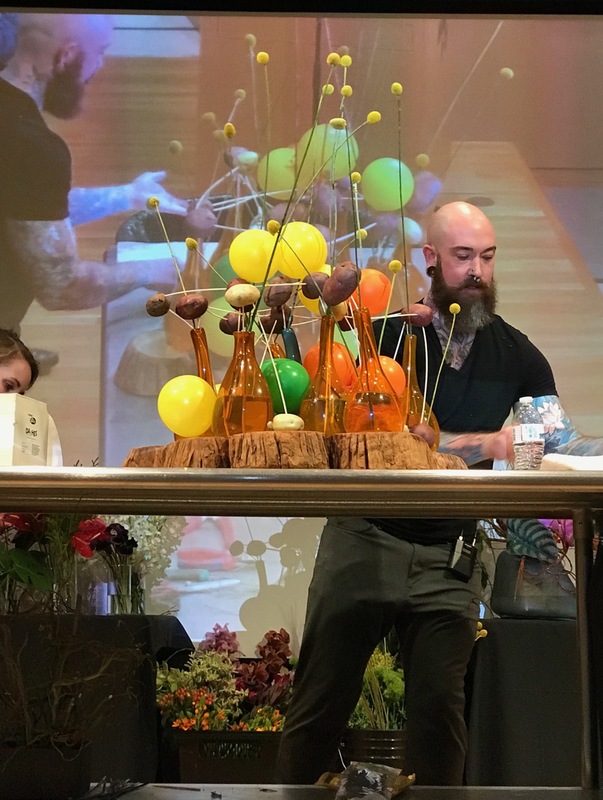 Williams wowed the audience for two hours with his imaginative designs. My camera battery had had enough by then so I took very few pictures. 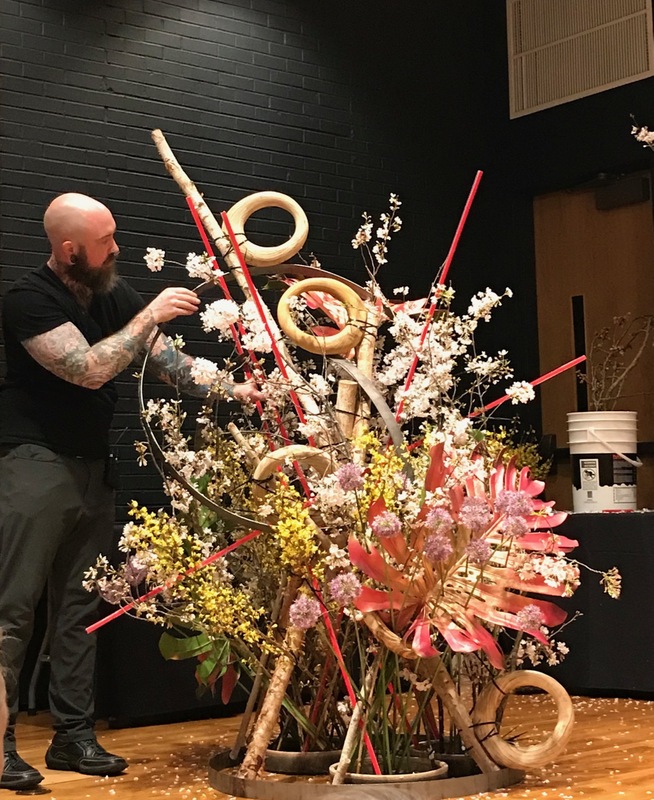 2018 Art In Bloom – Denver floral artist Arthur Williams. Cherry blossoms and forsythia. 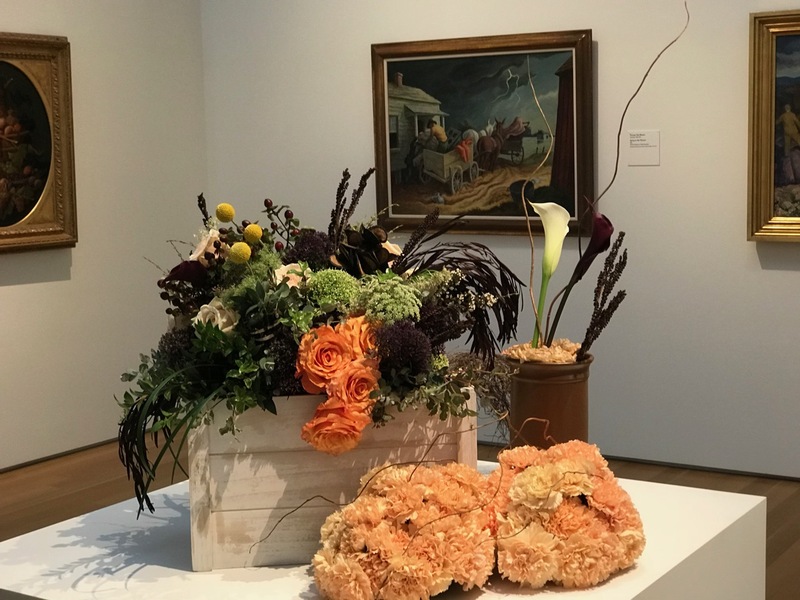 2018 Art In Bloom – glass bottles, balloons and potatoes. I am already looking forward to next year’s show. 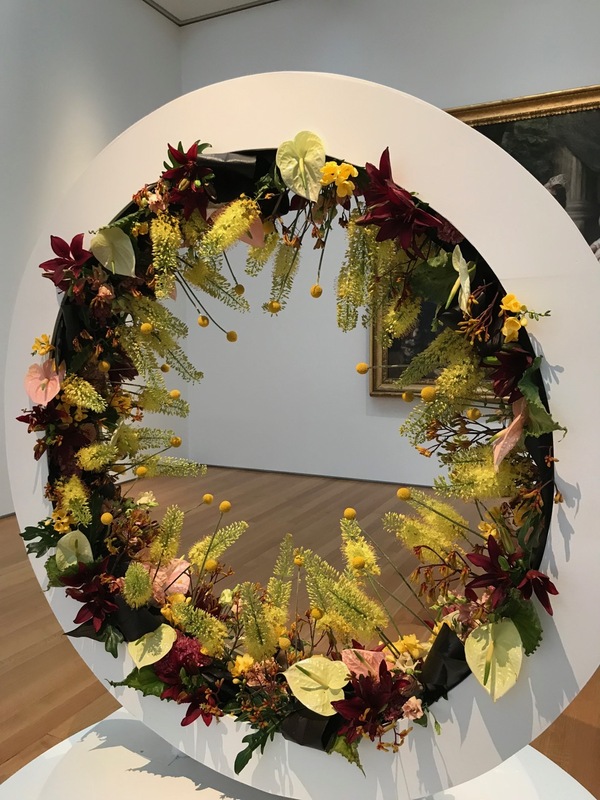 This entry was posted in garden and tagged 2018 Art In Bloom, NCMA, NCMAbloom on March 30, 2018 by pbmgarden. I can’t come up with enough superlatives to capture my reaction to these stupendous entries, Susie. I can certainly understand your reaction to the subtle tonal variations of Burkert’s creation – it was masterful. 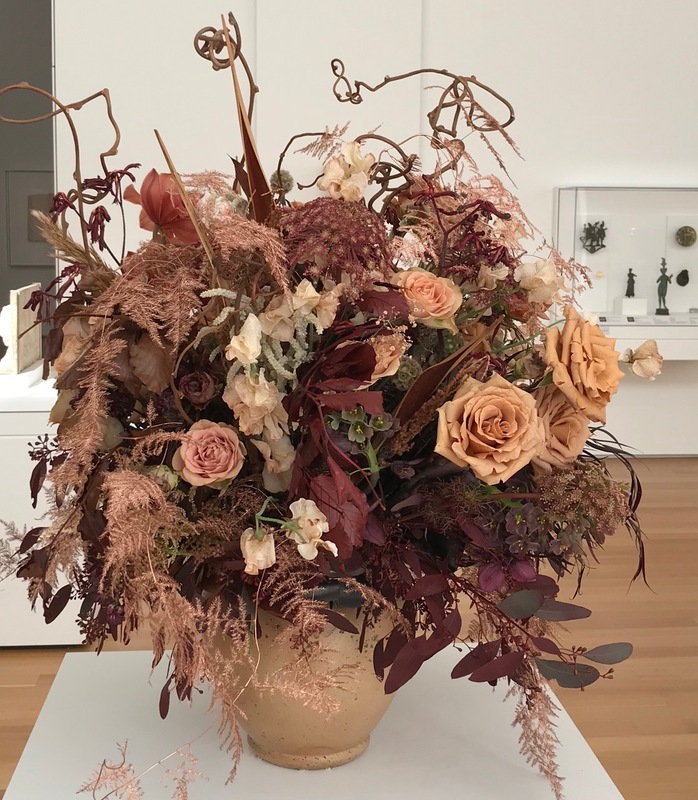 Do the exhibit’s organizers select the art work for the floral artists, or are they permitted to make those selections themselves from pieces in the museum? The art is assigned through a drawing, Kris. Luck of the draw! So glad you shared some of the entries, Susie, thank you! This is truly an outstanding show with talented designers contributing. 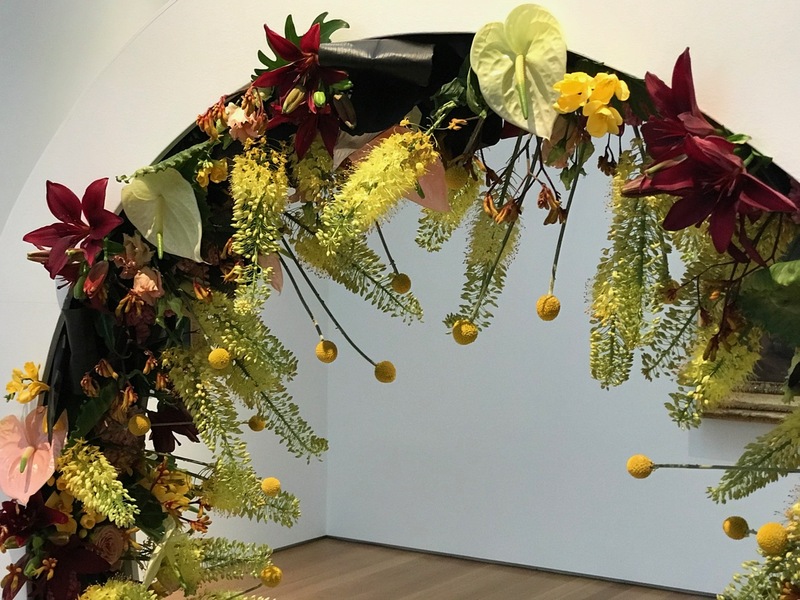 I went to Boston’s MFA Art in Bloom show once and it was meh. This was truly inspirational! Your favorite was amazing in color. I wonder how she got the asparagus fern that pinkish color? Thanks for reading my blog Jane. It is hard to absorb everything amid the hustle and bustle of the show itself, so isn’t it great we can take almost unlimited photos to help us remember (or see it differently altogether)? These are such a trip as well. 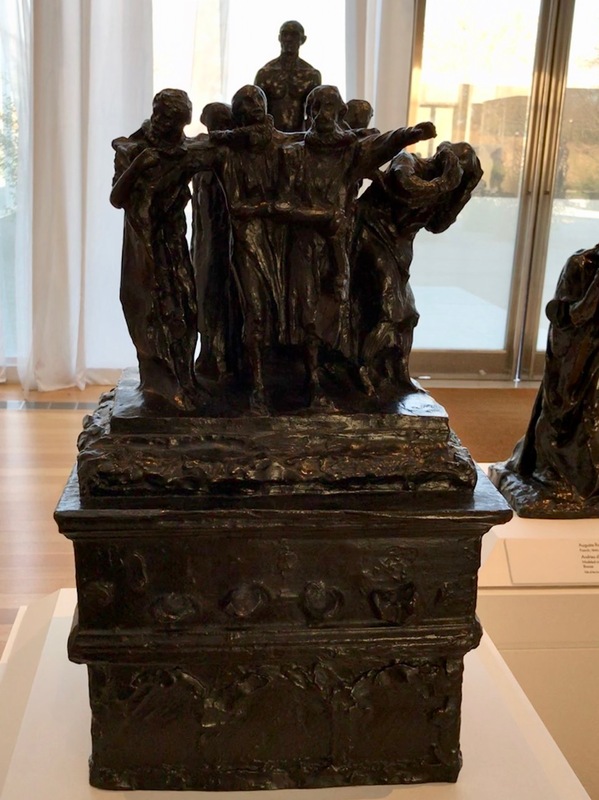 I remember Rodin, but I am not familiar with that sculpture. My uncle, who owned a foundry in Long Beach that made sculpture, happened to be a fan of Rodin. I wish I had payed more attention when I was younger. My uncle had a few reproductions of a variety of sculpture in and out of his home. Most had something to do with the reproduction process. Some would stay until the particular project was completed, and then be destroyed afterward. Others were actual reproductions that went off to a more appropriate home in public display somewhere. He had a reproduction of ‘the Kiss’ by Rodin, but it was not the sort of reproduction seen in museums. It was just a ‘copy’ of a copy. 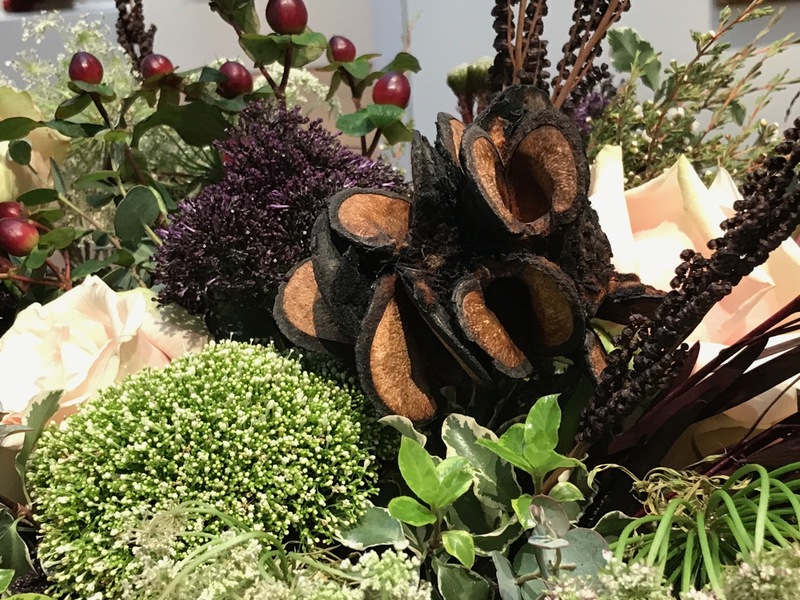 Wonderful arrangements, but I do agree with your choice, I love the muted colours, so different from the others. Pauline, glad you liked my favorite too. It would have been a challenge to come up with that idea for the color pallette. Thanks. Hope you can get to the show next year. 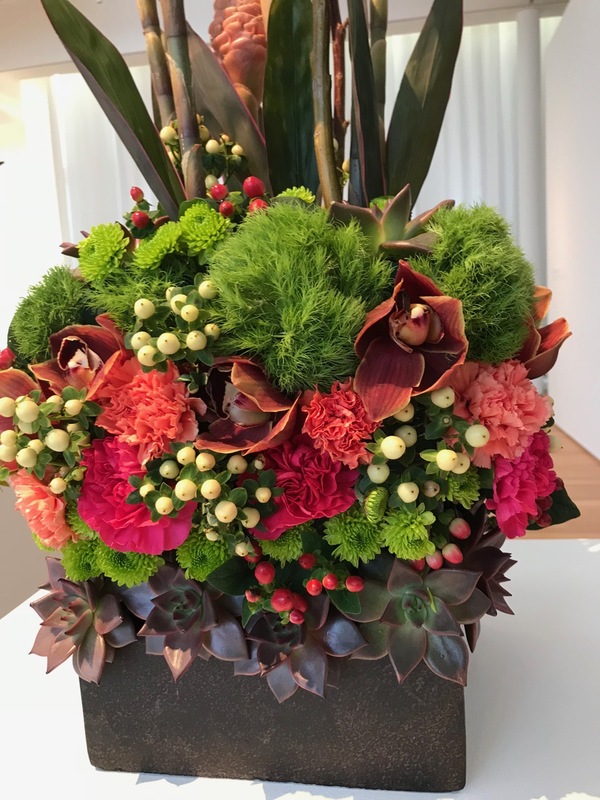 Wow, I would never think to combine those plants in that color palette of the first arrangement, but I like it! I think I would like it even better in the autumn. 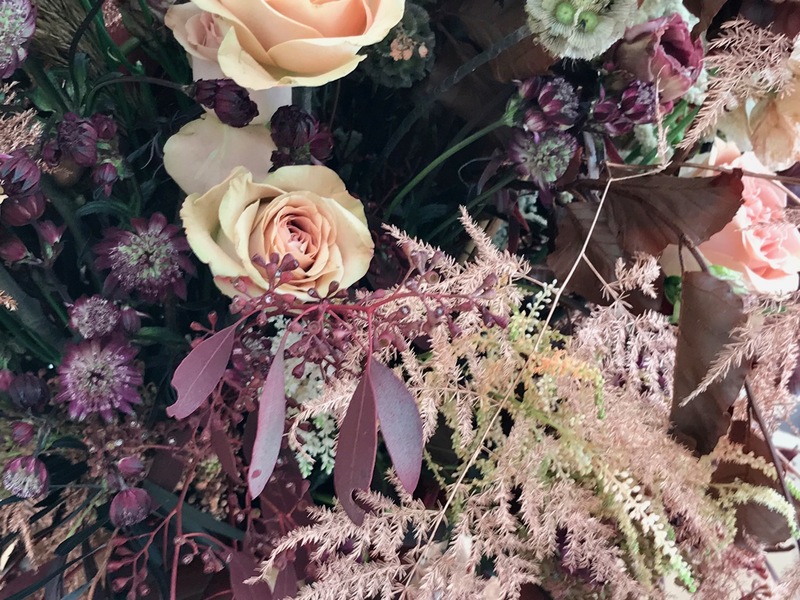 Peach and pale, deep magenta really merge well together, don’t they? The other arrangements are awesome, too. The circular display is so creative. Thanks for sharing! Beth, when I saw that first one it did seem autumnal or something very different than all the other designs. I think I stopped dead in my tracks to examine it. 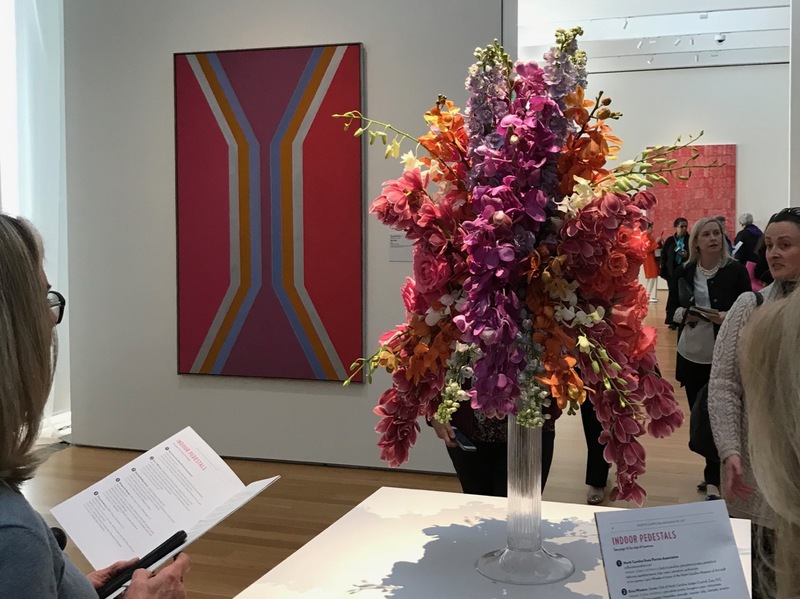 When I realized which art work was related to the piece I thought wow! Nailed it! Thanks for stopping by–glad you enjoyed these. Wonderful Susie. An inspirational post. I would love to have shared the day with you. 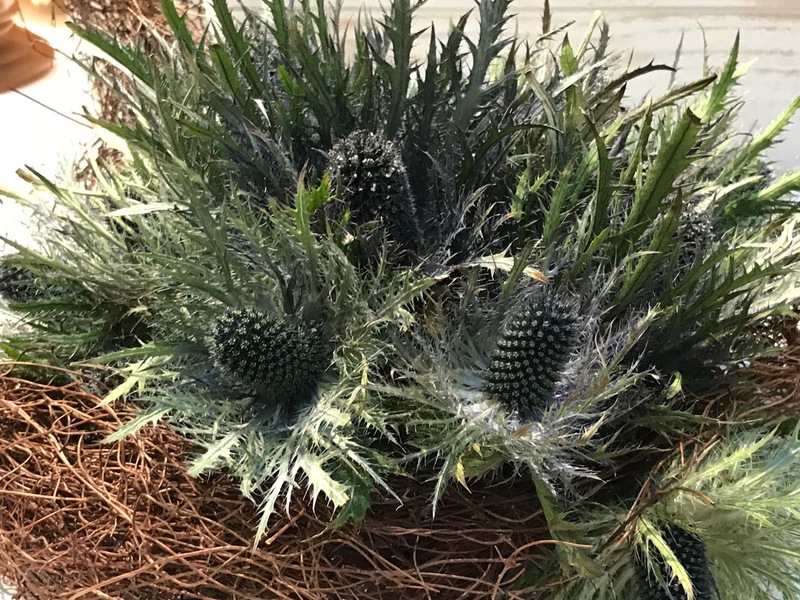 I’ve never seen anything like these arrangements anywhere. 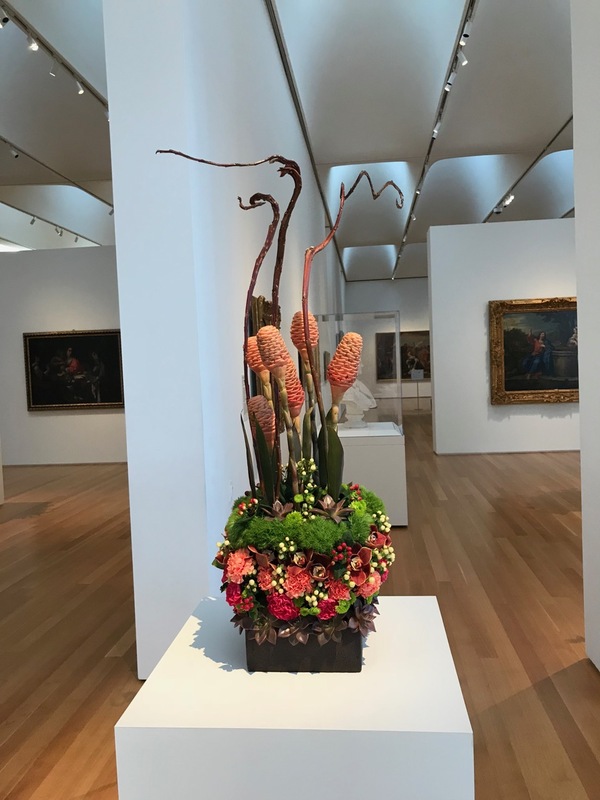 Are you going to try to create a Vase on Monday based on an artwork from your home? Maybe some carpentry ? Oh, what fun that would have been to see the show together. Next spring? I prepared a vase for tomorrow, but sadly no, not based on art; rather based on what I could put together quickly! 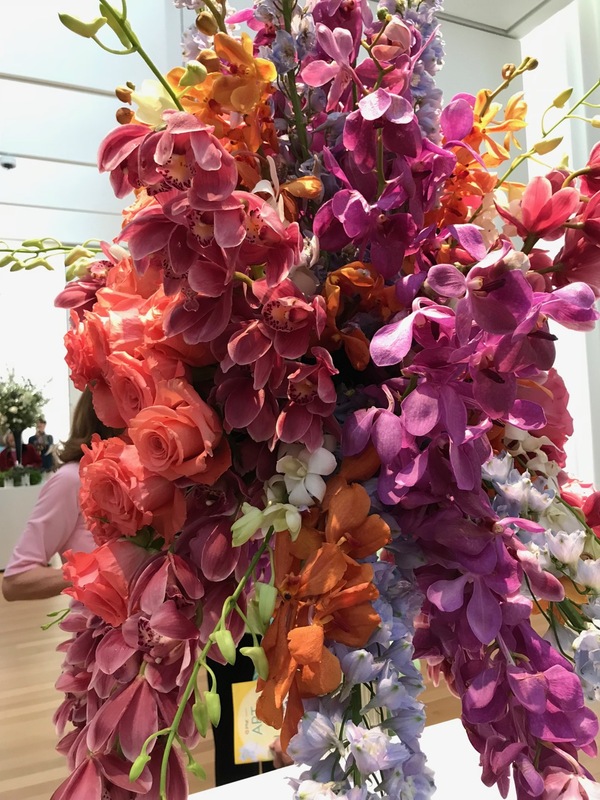 Would take a lot of planning and an enormous amount of flowers to pull that off. I’m content to admire from afar. Nice thought, it would be so much fun. Stunning! I really love that first one too. The colours are perfect, but also the idea of age and ‘patina’ if that is the right word. 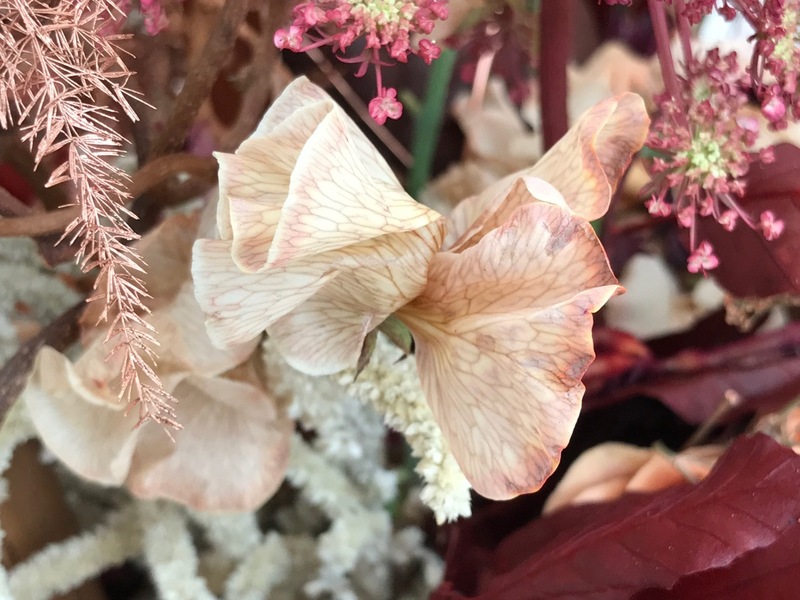 They are all wonderful – so much detail has gone into them they really are works of art. Thank you so much for sharing. Really enjoyed this! Cathy, I think patina is a great word to describe that first design. So glad you enjoyed seeing these with me. I like that circular arrangement! It is a good one. 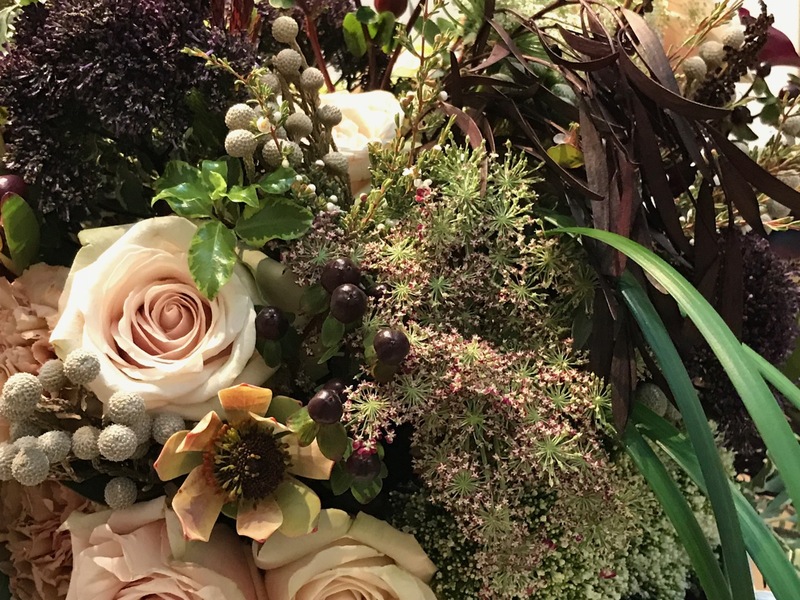 The flowers were impeccable. Hoping to get some of those foxtail lilies to plant this year.